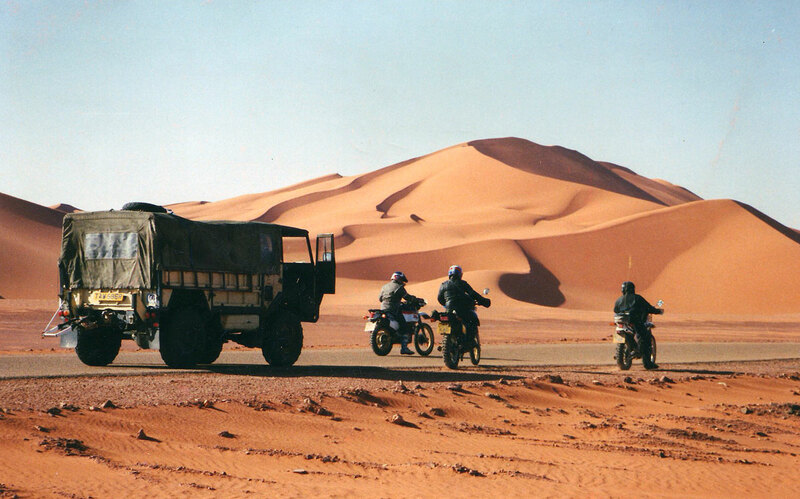 Welcome to Desert Travels; a resource around the book about my early travels in the Sahara in the 1980s, as well as a general blog on desert travel themes. You can buy DT for the price of a coffee off amazon uk, com and all the rest. The 2015 paperback (left) is now out-of-print. and is now being sold used on amazon for ridiculous prices. Desert Travels was originally published in 1996. It covered the first six of my forty-odd Sahara trips, starting as a clueless 21-year-old on a Yamaha XT500. 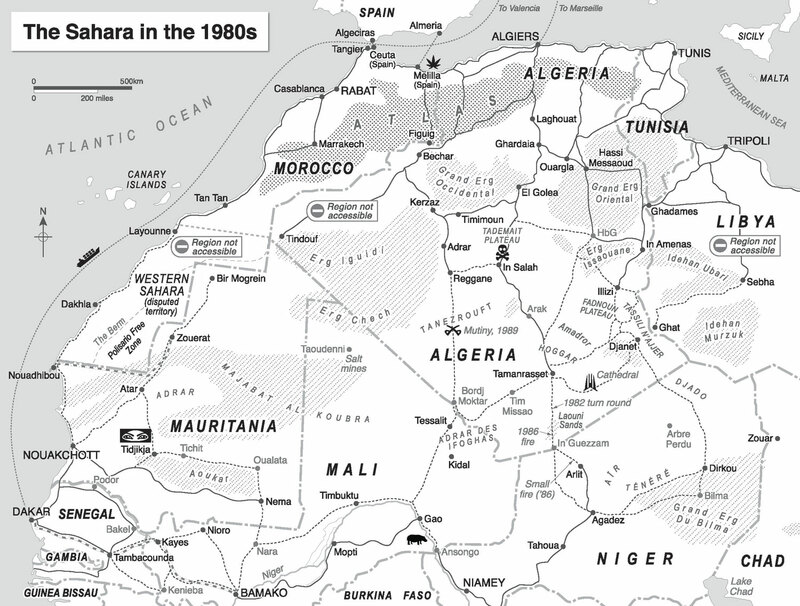 The book finishes about seven years later, following a fractious ride from Algeria to Mauritania via Timbuktu, just before nomadic rebellions swept the central Sahara in the early 1990s. Much of what I learned on those journeys found its way into my guidebooks, like Adventure Motorcycling Handbook and Sahara Overland. 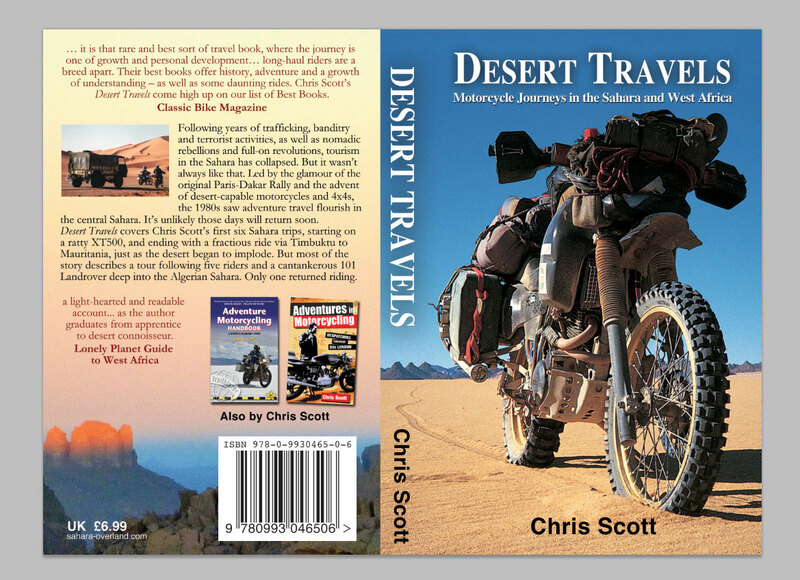 But most of Desert Travels describes my ‘Sahara Motorcycle Tour‘ of 1989. I managed to scrape together five guys to follow me and a cantankerous Land Rover support vehicle (right) for a month deep into the Algerian Sahara. Like it said on the back of the book: five set off from the UK, only one came back riding. Today, following over a decade of kidnappings, much increased trafficking, rebellions, revolutions and the spread of weapons from Libya, independent tourism in the central Sahara has collapsed or is severely restricted. But it wasn’t always like that. The 1980s were a Golden Age of desert tourism; post-colonial nations had yet to be beset by internal strife, while the popularity of the Dakar Rally, as well as the emergence of desert-capable motorcycles and 4x4s saw adventure tourism flourish in the central Sahara. Most winters the overlanders’ campsite in Tamanrasset was packed with VWs, Land Rovers, Ladas, BMWs, XTs. 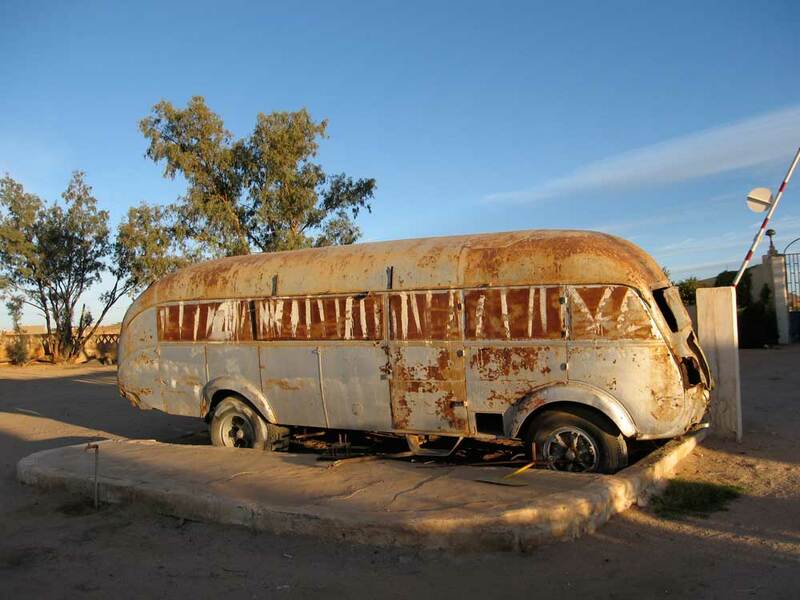 Today, when I stay in Camping Dassine it’s like an empty stadium – only the old ‘airstream’ Transsaharienne bus (left) rests where it always did by the entrance gate.